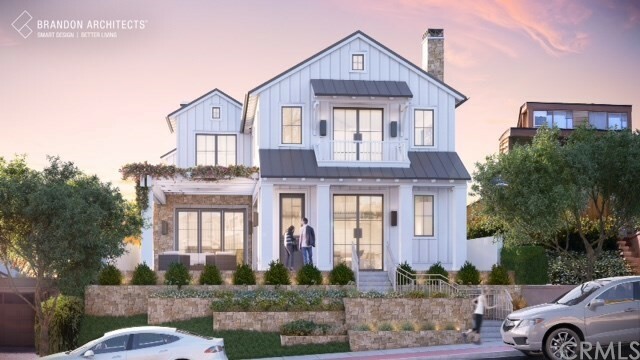 New Construction: Modern Farmhouse with industrial elements designed by renowned Brandon Architects; Corona Del Mar, south of Pacific Coast Highway this incredible home graces a forty-five-foot wide elevated lot providing privacy and vista views. This beautiful home is over 4100 square feet featuring a spacious and open floorplan full of natural light flowing out to the main floor courtyard and gardens. This home boasts four bedrooms, including a ground floor bedroom and full bath, five and-a-half bathrooms, an office and a den, formal dining area and large chef’s kitchen, prep kitchen and large walk-in pantry, as well as an elevator to all levels including the expansive rooftop deck with California Room, entertainer’s kitchen and outdoor dining area. This awe-inspiring master suite is the retreat that everyone dreams of including a the 450 square foot master walk-in closet, and resort style master bathroom designed with two water closets. Having worked with this fantastic builder on multiple properties, I can say that the quality and attention to detail is second to none. Expect the highest quality decorator finishes, artisan tile work and state of the art lighting and fixtures. This location offers quiet and privacy in the heart of the Village yet is just a short stroll to our beautiful beaches, world class shopping, dining and entertainment. Live where you play.